Mythologies from most ancient cultures were often concerned with nature’s renewal, from the daily reappearance of the sun, to the coming of spring or the flood, to the replacement of the king at his death, to the achievement of the afterlife. The continuation of life was of great importance to early people and the mysteries of renewal became the catalysts of many basic myths. Egyptian mythology was rich in gods and myths associated with renewal, and the various forms of the sun god, the survival of Osiris, and the concepts of kingship were all manifestations of it. Three additional gods were closely connected with fertility, and each in his own way illustrated some aspects of rejuvenation. From the border south of Abu Simbel, through the cataracts near Aswan, north toward Cairo and the sea, the river Nile flows through Egypt for over a thousand miles. The river has brought life to the desert and created a thin strip of green that provides water and food to millions of Egyptians and their animals. The source of all Egyptian life, the Nile was also the source of great mystery: where did it begin? What made it flood each year? What determined how high the waters would rise? It is not surprising, therefore, that this great and mysterious river would be the source °f much mythology. From almost the beginning of human life along the river, it played a role in religion and mythology; that role took its most concrete form in the personification of the river as the god Hapi. You guide of the darkness whensoever it is your pleasure to be its guide. And you make every place of work flourish, 0 Ptah. 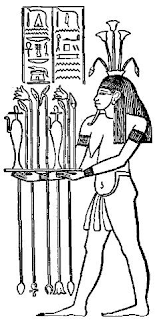 In this poem Hapi was compared with Ptah and, later, with Khnum because the poet thought of all three as creation gods who brought life to the earth. Since both humans and the land receive nourishment for life from the river, Hapi was said to be so important that if he were somehow to fail, all the gods would fall from heaven and all people would die. Hapi was thought to live in a cavern in the region of the first cataract from which the waters flowed, and the annual flood was called “the arrival of Hapi.” The god was depicted as a man with long hair and the heavy breasts of an old woman. This androgynous form combined the male and female life-producing forces. Actually there was a Hapi of the southern river and another for the northern river. The one from the south wore a headpiece of a clump of lotus flowers; the northern one wore papyrus flowers- When the two were depicted as a single god, he would carry both flowers as a sign of the union of Upper and Lower Egypt; wall carvings knotting the flowers together are also often seen. 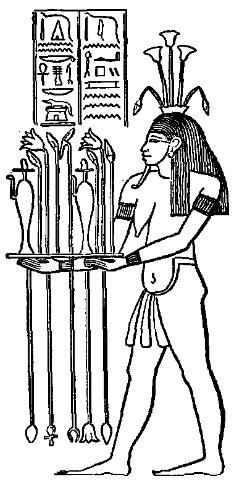 Because Hapi was the Nile and the river brought food, many other gods were associated with him. A hymn to Ra claimed that the sun god created the river, supposedly at the same time as he save shape to the watery abyss. In the Coffin Texts Hapi referred to himself as “the Primeval One of Earth.” This text made Hapi coeval with Nun, the watery abyss that existed at the beginning, and early in Egyptian mythology Hapi assumed the attributes of run. In addition, the story of Osiris connects the river to the great Sod of vegetation. It was on the waters of Hapi that Osiris floated Until Isis found the pieces and took them to be reunited. Primarily, Hapi was thought of as the source of food. In the Pyramid Texts he was to provide the food King Unas needed in the next life. There is also a prayer to the god of the river asking him to provide the grains that will nourish the king. Who comes with joy, the well beloved...? In the Book of the Dead a soul prayed to gain the power of Hapi. It was everyone’s wishing to drink from the waters of the canal in order to gain power over the green plants and herbs and bring gifts to the gods.